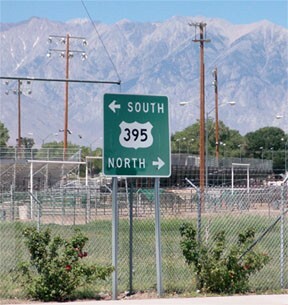 The view there is south on Main Street, just north of where US 395 comes in from the right and continues straight ahead. 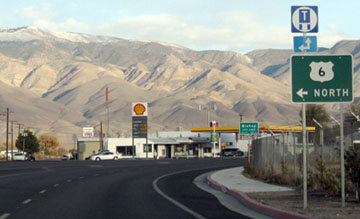 Looming in the background is the Sierra Nevada (Mt. 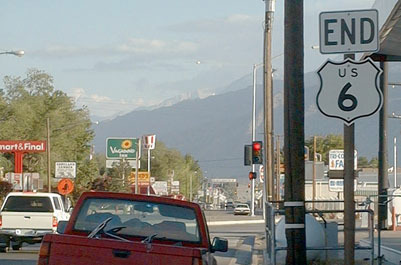 Whitney, the highest point in the 48 states, is in that range). 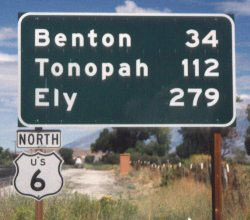 Unfortunately as of 2010 that sign was missing again. ​The White Mountains are again prominent in that striking shot -- in the distance one can see the northern edge of that range. 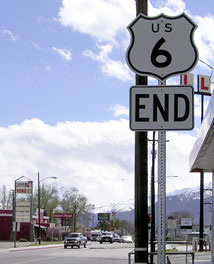 US 6 runs along the base of those mountains, which explains why the road actually runs not only north, but also slightly west before finally turning eastward into Nevada. 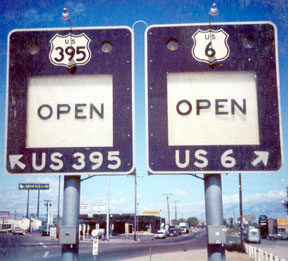 And thus can be seen the dilemma Caltrans has faced in terms of which direction to use in signing their segment of US 6. 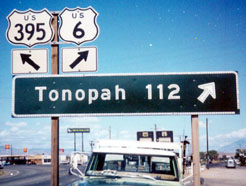 That sign was also missing as of 2010 -- now the first reassurance sign is at mile marker 23 (across from the sign shown in the first photo on this page). 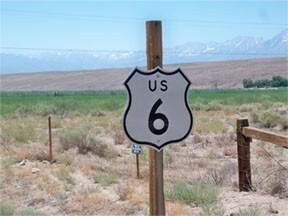 As a matter of fact, that is now the only reassurance marker along the entire California segment of US 6. Onward to Provincetown: 3200 miles. last updated Apr. 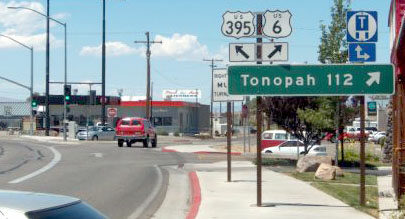 27, 2016.